We didn't get out the door until around noon, after chatting and confirming that Cheri's reading glasses had indeed been left at the Churchill War Rooms. It helps to have purple frames: immediate identification. I was so pleased that for once I wasn't the one retracing my steps for something I had inadvertently laid down on a table. We again traveled via the Jubilee line, and Cheri was very taken by the geometry of Westminster station. As we made our way to reclaim the glasses, we passed this building, dedicated to those, like our father, who would understand what the beams and pulleys above were actually there for. Glasses restored, we decided we'd take a look at the Cenotaph, after having seen lifesize photos of the Lutyens reliefs at the Royal Academy sculpture exhibition. This part of London is really terra incognita for me. I did have an A-Z with me, though, so that's really not an excuse for the fact that we never did find the Cenotaph. However . . . here's a memorial to British citizens lost in the 2002 Bali bombings. I didn't even know this existed. Now wondering, of course, how active Jemaah Islamiah still is in Indonesia. The Cenotaph is on Parliament Street, but I made a wrong turn and we ended up on the southern, non-Buckingham-Palace end of The Mall (see here for origin of this name and Pall Mall), with St James's Park on our left. It wasn't a bad place to be, since we walked past the imposing façades of several huge buildings owned by the Crown Estate. Visitors to London are familiar with Nelson's Column in Trafalgar Square, but here is the Duke of York Column, commemorating the son of George III who features in the "Grand Old Duke of York" nursery rhyme. 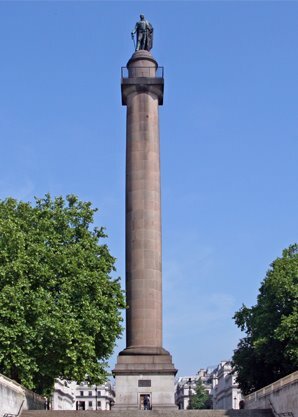 It was apparently paid for by docking the wages of every member of the British Army for one day in 1827. Those poor impoverished royals. This particular duke did die seriously in debt, however; his present namesake might find his biography salutary reading. Duke of York, clearly in "when they were up, they were up" mode. Eventually we found ourselves facing the rather grim St James's Palace, built by Henry VIII on the grounds of what had been the Hospital of St James. And this building nearby, Cheri, is Clarence House, former residence of the Queen Mother and currently home to Charles and Camilla. That sign on The Mall describing all those Carlton House edifices was misleading. Remember the guard and the restricted access when we went to leave the palace area? This is the reason for all that security. We gave up on trying to track down the Cenotaph and decided instead to succumb to the lure of window shopping along St James's Street, which conveniently would deposit us on Piccadilly, only a couple of blocks from Green Park tube station. Royal warrants were much in evidence; one boot store had two, from Prince Charles and Prince Philip. I neglected to take a photo, but do take a look at the website: http://www.johnlobbltd.co.uk/main/main.htm. According to a 2009 Wikipedia entry, the average price of a pair of bespoke leather shoes was £2700. I had to restrain Cheri from ordering gifts for the whole family. Cheri chose Borough Market over Covent Garden as our last stop, so we took the tube back to Southwark. On our way to the market, we passed the little-known memorial on Redcross Way to "Winchester Geese," the prostitutes whose brothels on the South Bank were under the jurisdiction of the Bishop of Winchester. What is now a parking lot was once the burial ground of "incontinent women."